Can you believe it is 5 weeks to Christmas? For my American friends only 4 days to Thanksgiving and 5 days to shop shop shopping? I won't be making it to the U.S for any black Friday shopping but the hubby plans to do some online cyber Monday shopping. Once the deliver happens we will eventually be making a trip down to pick up his electronic goodies. I hope to do a little more shopping for me on this trip as well. It seems like all my weekends until Christmas are already jammed packed with parties, dinners and baking. I can't wait for every bit of it. I still have to get my decorations up. It tends to be a full day production as I do have quite a few decorations These decoration include two trees, including my big beautiful 9 foot tree that I love and my every expanding Christmas village. Can you tell I am excited? This weekend, I went to the Seasons Christmas Show in efforts to expand my decorations a little bit more. I walked up and down the aisles admiring the beautiful decorations and gifts, while sneaking a few bite size treats from some dessert booths. I kept myself under control and only left with a cute Santa cookie jar and some beautiful candle holders. A sigh of relief for my hubby. My first Christmas dinner party is this upcoming weekend. I have put myself down for desserts. Cheesecake maybe? Here is my own creation of chocolate and pumpkin together in one of my favorite desserts. 1) Preheat oven to 350F. 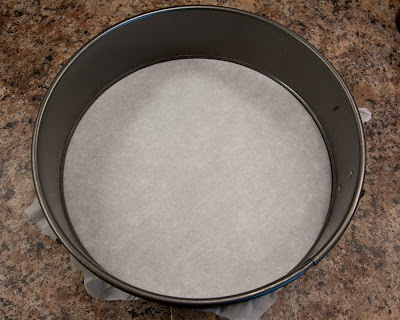 Place a piece of parchment over the bottom of the pan, hanging over the sides. Snap in the sides and lock into place with the excess parchment hanging through. 2) Combine crumbs, cinnamon and melted butter in a medium bowl. Stir together until crumbs are moistened. Press into the spring form pan, using a flat measuring cup to press down tight. 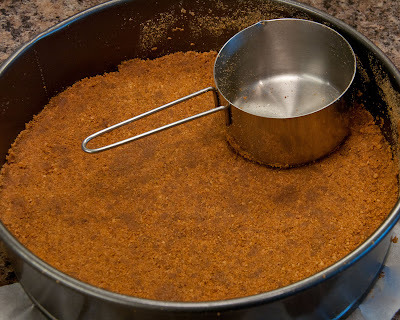 3) Bake for 10-12 minutes, until crust is lightly golden. Remove and increase oven to 400F. 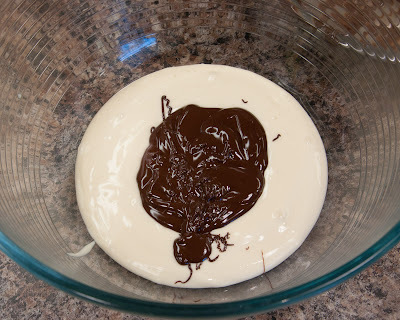 4) Melt the dark chocolate over a double boiler until smooth. Set aside to cool. 5) Add the cream cheese to your food processor. Process until almost smooth. Add sugar and process until combined. 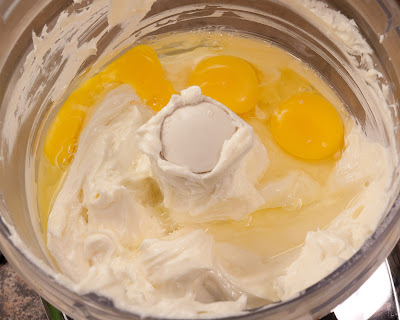 6) Add eggs and vanilla and process until the mixture is fluid and lump free. 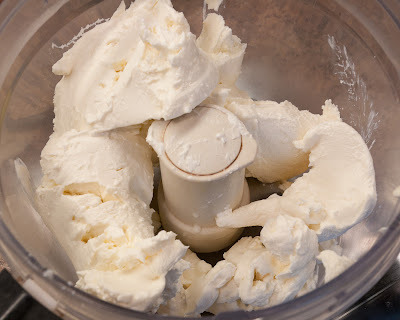 7) Take out 1/3 off the filling and place in a medium bowl. Stir in the melted, cooled chocolate. 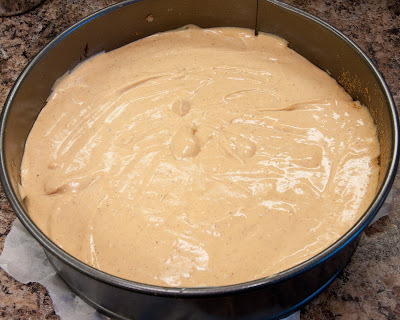 Place this filling in a piping bag with a 1/4 – 1/2 inch hole. 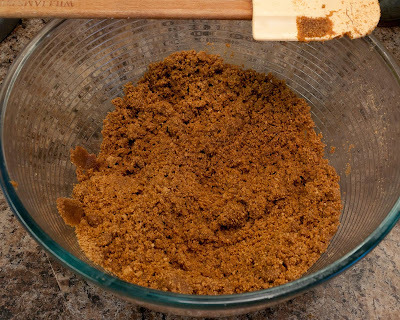 8) Add the pumpkin, nutmeg, cinnamon and flour to the mixture remaining in the processor and combine for 10-15 seconds, to blend in the pumpkin through the mixture. 9) Pour the pumpkin mixture onto the crust. Tap pan to flatten. 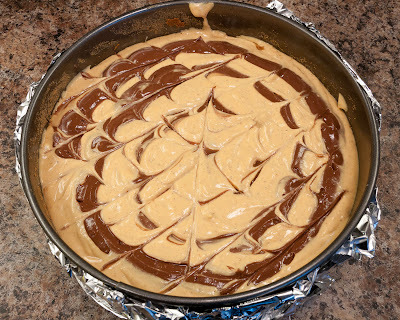 Starting at the outside, place the tip of the chocolate piping bag directly into the pumpkin filling and swirl through the cheesecake in a circular motion moving inward, piping the chocolate into the pumpkin. Run a knife through making several lines to get the pulled effect. 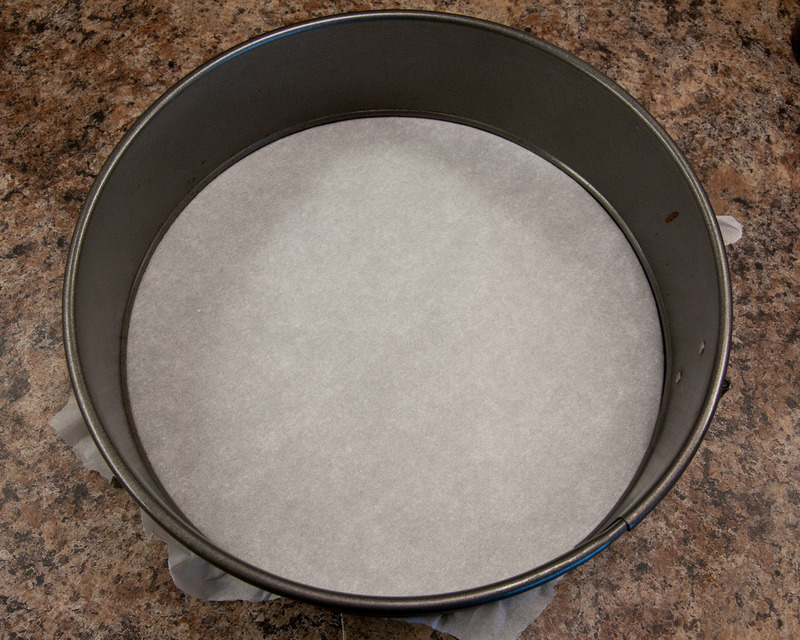 10) Cover the bottom and up the sides of the pan with tinfoil to protect from water. Place the cheesecake in a water bath and bake for 10 minutes at 400F. Then reduce heat to 300 and bake for 30 minutes. Top should be just about set. Turn off oven and leave cheesecake in oven for 15 minutes. Remove and let cool completely on wire rack. Cover and store in the refrigerator for up to 2 days. 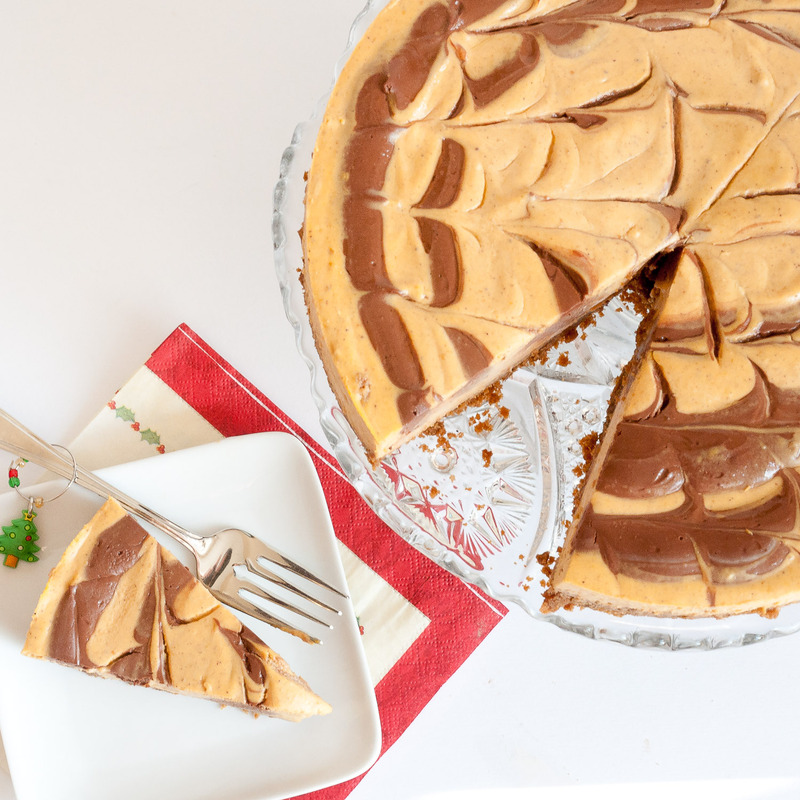 This is a beautiful combination of pumpkin and chocolate. 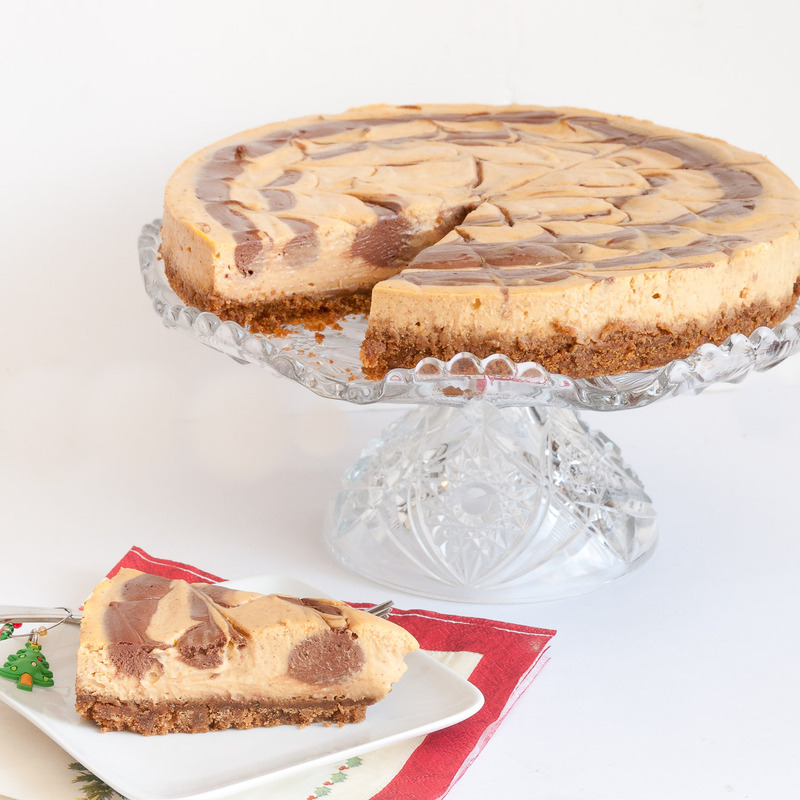 The cheesecake was smooth and creamy with rich swirls of chocolate decadence. I was so happy with the way this turned out. Even my sister who doesn't really like pumpkin desserts liked this cheesecake. Although I still find myself doing last minute shopping, at least I will have spare time to spend in the kitchen...probably whip up this swirly cheesecake of yours. Thanks for posting!